Prof. Patrick Joseph Browne was born in Berwyn, Illinois on November 9, 1947. He grew up in Brookfield, Illinois, where he attended St. Barbara’s grade school and later St. Joseph’s High School in Westchester. After his graduation from high school in 1965, Pat received a B.A. in biology from North Central College in Naperville. It was while he was a student at North Central that he began his study of jujitsu. Pat had an interest in martial arts throughout his childhood and had studied some judo and karate while still in elementary school. Then, in the fall of 1967, Pat visited the Naperville YMCA and saw DanZan Ryu jujitsu for the first time. The class that evening was being taught by Steve Paulding Sensei, a longtime student of Professors Ray and Marie Law. Steve had a class full of beginners, and he urged Pat to join and help him. Pat began learning DanZan Ryu the next day. A few years later, Pat founded Explorer Post 187 Judo Club, where he taught until 1972. Pat was promoted to the rank of shodan in 1969. He also took over the Naperville Judo Club from Steve Paulding in July of that year, when Steve left the Midwest after completing his graduate studies. 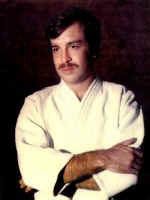 Pat was promoted to nidan in 1970. In 1973, Pat took a job as a biochemist at Michael Reese Hospital in Chicago, and was promoted to sandan that year. In 1974, Pat moved his jujitsu club to the Downers Grove YMCA and renamed it the Suburban KodenKai. Pat continued to teach in Downers Grove until 1990. In 1983, Pat was promoted to Professor by the AJJF. During these years, Pat completed a Masters Degree in counseling psychology from the Alfred Adler Institute and worked as a therapist with AIDS patients. Pat also developed an interest in acupuncture. In 1978 he graduated from the Accumoon School of Acupuncture, and in 1981, the Midwest Center for the Study of Oriental Medicine. He received national certification as an acupuncturist and served as the president of the Illinois State Acupuncture Association from 1988-1990. Pat was instrumental in getting acupuncture licensed in Illinois. The Illinois Acupuncture Practice Act was signed into law on January 31, 1997, a few months after Pat’s death. In 1983 Pat hosted Camp Kodenkan Midwest for the first time. Through the 10-day camp every summer, Pat was able to introduce the Midwest jujitsu students to the top DanZan Ryu instructors in the country. Also, camp created and solidified the Midwest Kodenkan community. In the summer of 2002, Camp Kodenkan Midwest celebrated its 20th anniversary. In 1984 Pat sponsored the first of many AJJF massage certification programs. He was instrumental in spreading Okazaki Long Life Massage throughout the Midwest. In 1990 Pat wrote an in-depth study of shingin no maki, which combined his vast knowledge of both Eastern and Western medicine with his extensive training in the DanZan Ryu techniques. He would present a copy of this manual to his students when he initiated them into shingin no maki. It was also in 1990 that Professor Browne moved his dojo from the Chicago suburbs into downtown Chicago, where he taught until 1996. In 1991, Pat began the study of Ikenobo ikebana with Nakashima Sensei. Pat related the practice of flower arranging to his martial arts training and eventually achieved the rank of Advanced Student. Pat’s arrangements were the focal point of the tokonoma at all of the Midwest jujitsu events for the next five years. In the winter of 1996, Pat’s health began to fail. It was at that time he told his family, friends and students that in 1983 a needle in a machine at the biochemistry lab had accidentally pierced his thumb. At the time it happened, there was no test for AIDS. A few years later, he was tested and found to be HIV positive. Pat didn’t tell anyone at the time, feeling there was nothing that could be done. Pat attended his last AJJF convention in March, 1996. He passed away on May 23 of that year, surrounded by his family and jujitsu yudansha. Professor Browne held the rank of 7th dan in DanZan Ryu at the time of his death. Over the years, Pat promoted 17 black belts and was responsible for the propagation of DanZan Ryu jujitsu throughout the Midwest. As of 2002, there are at least a dozen active DanZan Ryu schools currently headed by Pat’s yudansha or their students, and that number is growing every year. Also, several of Pat’s black belts are currently massage therapists or acupuncturists as a direct result of Pat’s inspiration. In September 2002, Professor Pat Browne was inducted into the DanZan Ryu jujitsu Hall of Fame by the Shoshin Ryu Yudanshakai. Each year at the end of May, Pat’s friends, students and his “grand students” (as he used to call them) gather for the Professor Pat Browne Memorial Convention to celebrate Pat’s life through the practice of DanZan Ryu jujitsu.